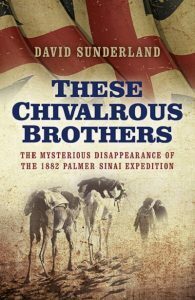 These Chivalrous Brothers is the story of the 1882 Palmer Sinai Expedition, a spying and terrorist mission that ended in the murder of its participants and was one of the great cause célèbre of the nineteenth century. Just before sunset on August 8th 1882 HMS Cockatrice, a small paddle wheel gunboat, appeared off the Egyptian shore. A rowing boat was lowered down its side and slowly moved towards the beach. On its arrival, six men and a teenage boy alighted. Three of the group were British, all dressed as Arabs, two were Bedouin tribesmen, one a Jew and one a Syrian. The following morning, this mismatched party set off for the desert, taking with them two boxes of dynamite and £3,000 in gold coin. Five of them were never seen again. An historical ‘who-done-it’, an adventure story, a history of the Anglo-Egyptian War and a biography of those involved in the controversy, These Chivalrous Brothers explores the gulf between the Imperial ideal and reality and provides an insight into the character of the men who built the Empire.